FORT COLLINS, Colo. – This town has earned the nickname “Fort Fun” because of its abundance of micro-breweries, restaurants and nightlife at places like “The Drunken Monkey”, where bar stools are replaced by large swings. But it continues to be anything fun for UNLV’s basketball team. For the sixth straight year the Runnin’ Rebels lost to Colorado State at Moby Arena, this time 91-77 on Wednesday night before an announced crowd of 2,464 in the Mountain West Conference opener for both teams. The good news? Well, unlike last season, when UNLV found a way to blow a five point lead in the final minute causing usually mellow head coach Dave Rice to use words like “pissed off” and bringing star forward Ben Carter to tears outside the locker room, head coach Marvin Menzies’ job is safe. Rice was fired four days and a loss at Wyoming later. UNLV (7-7, 0-1 Mountain West) looked like it might snap its losing streak at Moby for a while, connecting on six of its first nine 3-pointers and building a 41-32 first-half lead on a three-point play by sophomore guard Kris Clyburn. But the Runnin’ Rebels managed just a pair of Uche Ofoegbu free throws over the final five minutes as Colorado State (9-5, 1-0) rallied for a 46-43 halftime lead, and the Rams took control with a 13-0 spurt early in the second half. 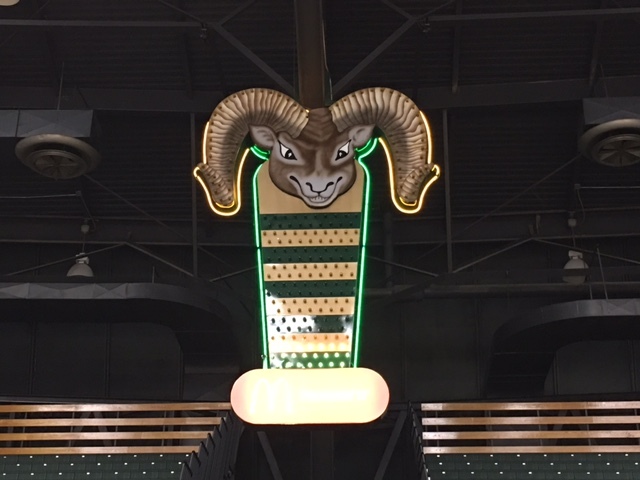 HOW IT HAPPENED: Colorado State outscored the Runnin’ Rebels, 29-5, over an eight-minute stretch that began with 4:12 to go in the first half and ended with guard Prentiss Nixon’s fast break layup to cap the Rams’ 13-0 run to give CSU a 61-46 lead with 16:04 remaining. Colorado State finished with a 40-20 edge in points in the paint, frequently exploiting UNLV’s inability to defend dribble penetration. But it was three consecutive 3-pointers by guard Gian Clavell over a 51-second span that highlighted the 13-0 spurt and broke the game open. WHO STOOD OUT:The 6-foot-4 Clavell, who missed CSU’s first nine games due to a suspension for a violation of the school’s Student-Athlete Code of Conduct, scored 14 of his game-high 21 points in the second half and to go along with 11 rebounds and two steals. Senior forward Emmanuel Omogbo (15 points, 13 rebounds) also had a double-double for the Rams while freshman forward Troy Baxter Jr. led the Rebels with 15 points, including 3-of-4 3-pointers. “I’m confident that we’ll get there. I’m just hopeful that it’s sooner than later.” – Menzies. UP NEXT: UNLV hosts Wyoming (11-3, 1-0), a 84-72 winner over Air Force in its Mountain West opener on Wednesday, on Saturday afternoon at 1 p.m. at the Thomas & Mack Center. NOTABLE: Clyburn came up one rebound short of his second straight double-double, finishing with 12 points, nine rebounds and four steals. … UNLV fell to 3-7 all-time when opening Mountain West play on the road. … Baxter’s 15 points were a career high. … The 91 points were the second most scored this season by Colorado State; the Rams had a season-high 93 against Division II Arkansas-Fort Smith on Dec. 6. … Runnin’ Rebel junior forward Dwayne Morgan, who is leading the team in rebounding (7.3 per game), missed his fifth straight game with hip and shoulder injuries. … Colorado State’s 47 rebounds were the most by a UNLV opponent this season topping the previous high of 45 by Kansas. … The Rebels finished 19-of-30 at the free throw line (63.3 percent), including just 10-of-19 in the second half (52.6).